Smile Design: The prep and seat. Prepless Veneers: Smile design and seat. The Principles of Advanced Minimally-Invasive Dentistry. Basics of masticatory function and parafunction and the occlusal strategy to manage it. The Diagnostic Model for the General Dentist. Learn From the Dental Industry's TOP LEADERS! Register for a PREMIUM membership and learn from the best in the industry! Viewing this course and completing the quiz that follows with a passing score of 80% or better will earn you 2 Continuing Education Credits. Click the video image on your right to watch a sample of this course. If you would like to view the full course please login or register as a new member. Currently in full time private practice at the Berland Bental Arts Center, which is a group practice providing comprehensive dental care in one location. He provides the surgical and sedation aspect of the practice. Dr. Berland is a Fellow of the American Academy of Cosmetic Dentistry (AACD), the co-creator of the Lorin Library Smile Style Guide, and the developer of the Web site , www.denturewearerscom. 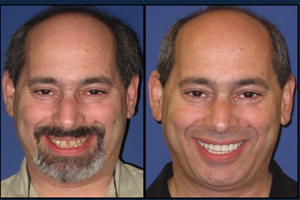 Dr. Mark Margolin and Dr. Lorin Berland take a patient from beginning to completion of an all-on-4 procedure to show you what to realistically expect. The course follows an actual case that they performed. Often times the procedure is made to look quick and easy, but there is the reality that to be successful there is a lot of pre-planning and many follow-up restorative visits that any clinician considering offering this procedure to their patient must consider. Disclaimer: No commercial support was recieved for this program. Dr. Margolin and Dr. Berland describe the All-on-4 case that will be demonstrated in this video. Dr. Margolin will begin by extracting the maxillary teeth. Dr. Margolin demonstrates the use of the bone reduction guide and discusses with the lab what is necessary to fabricate the bone reduction guide. Dr. Margolin demonstrates the placement of the implant fixtures. You must be logged in to view a course. You can watch an excerpt from this course. This course is not yet in your library. Would you like to add it now? You do not have enough credits in your account to add this course. Would you like to buy an additional credit? This course is only available to Premium members or members who have purchased this course for their permanent library. A Premium membership gives you access to all courses in the HDiQ library. Access is available as long as the membership is maintained. CEs earned and certificates received will be available even after membership is cancelled. This course can be added to your permanent library with a one time purchase fee of $140. You will always have access to your permanent library. CEs earned and certificates received will also be permanently available. Have a Promocode for a FREE course? Enter your code below and watch this course immediately. © Copyright 2019 HDiQ Dental. All Rights Reserved.